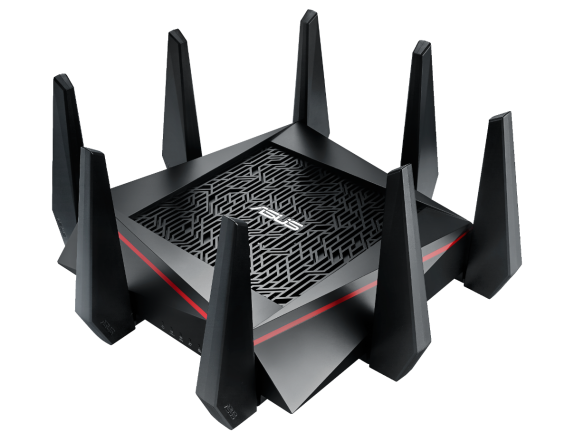 Asus has announced a new router at IFA in Berlin. The new product from the Taiwanese manufacturer carries the model number RT-AC5300 and according to the company, the router delivers the world’s fastest Wi-Fi speed. RT-AC5300 comes with a Broadcomm NitroQAM chip and delivers 1000Mbit/s on the 2.4GHz band and up to 2167Mbit/s on each of the two 5GHz bands for combined speeds of up to 5334Mbit/s. The router has 4 transmit and 4 receive antenna configuration, which improves the Wi-Fi range and signal stability. Asus says that the RT-AC5300 offers 500 square meters signal coverage. Asus’s newest router comes with tri-band smart connect, which ensures that each device is assigned automatically to the most appropriate band for maximum speed and stability. The Multi-user MIMI ensures no drop in network speeds even when multiple devices are connected. It also has a link aggregation using which you can combine two LAN ports into one superfast 2Gbit/s wired connection. The router comes with four gigabit LAN ports, USB 3.0 port and a USB 2.0 port on the back. There’s no word on the pricing just yet, but we know that the RT-AC5300 will hit the stores before the end of the year.